St. Petersburg to Moscow River Cruise will take you on an unforgettable journey on the longest river in Europe, the Volga River. 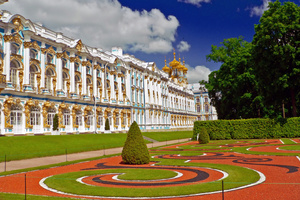 In the beginning enjoy a couple of days of sightseeing in St. Petersburg, visiting the Hermitage Museum, Catherine’s Palace with the Amber Room, and St. Isaac’s Cathedral. Depart St. Petersburg on the Svir River and reach Lake Ladoga, and later the small vacation village of Mandrogi. Discover Lake Onega, fed by 58 rivers and home to 1369 islands. 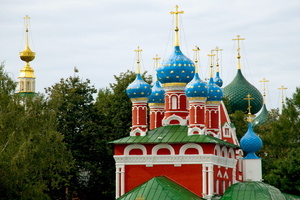 Visit Kizhi, the most famous island, known for its open-air museum of wooden churches, cathedrals, and houses. St. Petersburg to Moscow River Cruise is the best way to see both metropolitan cities and the countryside with its quaint, old towns. Enjoy a visit to the monasteries in Goritsy and Yaroslavl, small towns on the river bank, and explore the impressive church of St. Dmitri on the Blood, where the son of Ivan the Terrible was murdered, in the town of Uglich. 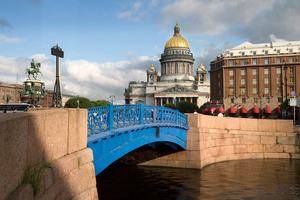 End your St. Petersburg to Moscow River Cruise with a couple of days of sightseeing in Moscow. The MS Volga Dream CRUISE ONLY program from St. Petersburg to Moscow on board the most luxurious ship on Volga River. The cruise introduces you to the old Russian towns and villages of the Golden Ring. 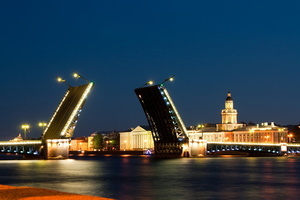 Several nights before and after the cruise are recommended in Moscow and St. Petersburg and can be arranged separately. Platinum Program aboard an luxurious 5* vessel designed in classic decor and accommodating just 109 passengers. She is the best choice for travelers seeking intimate cruise experience and personalized service. You will spend 3 nights at the hotel in Moscow, 6 nights onboard and 3 nights at the hotel in St. Petersburg. Gold Program aboard an elegant 5* vessel designed in classic decor and accommodating just 109 passengers. She is the best choice for travelers seeking intimate cruise experience and personalized service. You will spend 3 nights at the hotel in Moscow, 6 nights onboard and 3 nights at the hotel in St. Petersburg. St. Petersburg - Moscow M/S "M. Rostropovich"
Our shortest Volga River cruise on a 5* luxurious 4-deck motorship "Mstislav Rostropovich" . This luxurious four-deck vessel was built in Czechoslovakia in 1980 and fully refurbished from the hull in 2009. There are spacious cabins onboard, most of them featuring balconies which is very rare on a river ship. St. Petersburg - Moscow M/S "Nikolay Chernyshevsky"
Motorship «Nikolay Chernishevsky» is a comfortable four-deck vessel (type 301). Built in Germany in 1981, refurbished in 2017, the motorship is equipped with modern navigational facilities and exceeds the speed of 26 km per hour (around 17MpH). St. Petersburg - Moscow by MS "Prince Vladimir"
St. Petersburg - Moscow M/S "Georgy Chicherin"
Motorship «Georgy Chicherin» is a comfortable four-deck vessel (type 302). Built in Germany in 1984, refurbished in 2012, the motorship is equipped with modern navigational facilities and exceeds the speed of 26 km per hour (around 17 MpH). St. Petersburg - Moscow M/S "Shashkov"
Motorship «Z. Shashkov» is a comfortable four-deck vessel (type 302). Built in Germany in 1986, refurbished in 2013, the motorship is equipped with modern navigational facilities and exceeds the speed of 25,5 km per hour (around 17 MpH). I wish to thank you for all your help in planning our trip from St. Petersburg to Moscow. All went very well. The train ride was uneventful. We did need some assistance from the concierge at our hotel in St. Petersburg in deciphering the signs in the railroad station. We had her write our the words "departure" and "arrival" in Russian, so we would know what track our train would be leaving.